Fluffy Ruffles? Is that a thing? Indeed it is. A person, actually – albeit in comic-strip form. And her namesake drink has sensational flavor. The name evokes fancy dress, so it’s perfect for weddings, graduation parties, and other June events. But it also recalls an earlier era of women’s activism (more about that later). So feel free to drink it in jeans or yoga pants. We found this cocktail while browsing Harry Craddock’s The Savoy Cocktail Book. Craddock was a legendary barman who invented many drinks—though not this one. 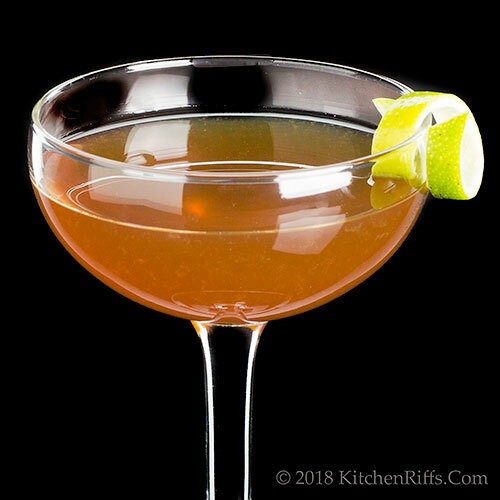 Hugo R. Ensslin probably was the first to write about this cocktail (in the second edition of his 1917 gem, Recipes for Mixed Drinks). But did Ensslin originate the Fluffy Ruffles? No one knows. It may have been invented to promote a 1908 Broadway musical of the same name. The musical was based on the then-popular Fluffy Ruffles comic strip that ran in the New York Herald (see Notes). 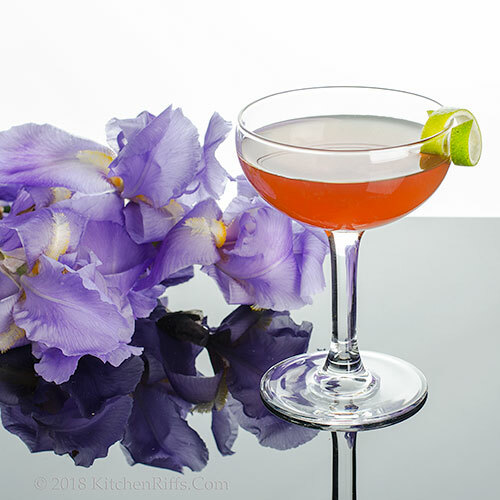 The original recipe calls for this drink to be shaken along with the hollowed-out hull (rind) of a lime. Instead of the lime hull, we substitute a small amount of fresh lime juice, which we think makes for a better drink (see Notes). This recipes takes about 5 minutes to prepare, and serves one. Add all the ingredients (except garnish) to a cocktail shaker half filled with ice. Shake vigorously until well chilled (about 20 seconds). Strain into a cocktail glass or coupe, preferably one that has been chilled. Garnish, if you wish, and serve. How much lime juice to use? We generally go with ½ teaspoon, but feel free to experiment. Anything up to 1 teaspoon tastes fine. If you use more than that, the flavor of the lime becomes too prominent, in our opinion. Why did the original recipe call for shaking the drink with a lime hull? The idea was that the ice would abrade the skin of the lime, releasing its volatile oils into the drink (these oils are found only in the peel, not the juice). We get the same effect by holding the lime over the drink while cutting a twist garnish. As we cut, some of the volatile oils spritz the surface of the drink. Should you use light or amber rum? We prefer a mild-flavored amber, although light (white) rum works too (and is probably more traditional). Our “house” amber rum is Appleton Estate Reserve Blend, from Jamaica. It has good flavor and is not too expensive. Any sweet red vermouth should work in this drink. We’ve used both Dolin and Martini and Rossi, and both are quite pleasant. Our usual disclaimer: We’re noncommercial and don’t receive compensation for naming brands. We suggest only what we like and purchase with our own money. If you’re still in doubt about what to use, we suggest visiting your friendly local liquor store and requesting guidance from the salespeople. We’ve received invaluable advice over the years just by asking. BTW, although June is the traditional “wedding month” in the US, October has replaced it as the most popular. So it’s a good thing the Fluffy Ruffles Cocktail can be enjoyed year round. OK, so who was Fluffy Ruffles? She was the heroine of a comic strip that began publishing in 1907. The premise was that Ms. Ruffles had lost her inheritance and needed to look for work. Dressed in her Gibson Girl attire, she went out each week to seek employment in a new field (sales clerk, dance instructor, window dresser). But her alluring appearance would always cause a commotion as men gathered to gawk and flirt with her—so she’d end up losing her job. The comic strip created a sensation and inspired products ranging from paper dolls to cigars. The Fluffy Ruffles phenomenon is recounted in more detail here. The setbacks that Fluffy endured were all played for laughs, of course. But, as so often, the humor tapped into deeper social anxieties. At the time the strip began to run, women were entering the workplace in larger numbers and were actively seeking legal rights. Many women clearly understood the subtext: The Fluffy Ruffles musical featured a speech about women’s suffrage (women in the US finally won the right to vote in 1920). Programming Note: Summer is here, which means it’s time to start our annual Summer Sippin’ and Snarfin’ Series. We generally do only one drink recipe a month (usually the first Wednesday). But in the summer we up the number of drinks (because summer heat means summer thirst). And we’ll make sure all our food recipes through Labor Day are summer-appropriate. “And those were the guys who brought us Prohibition,” I said. Thank you for sharing this lovely cocktail and putting the timely context around the history of this drink. Fluffy Ruffles is a new heroine to me! Your photos are gorgeous. Thanks to all your posts, I'm going to vow to drink more booze. Though I have commitment problems when it comes to upping my alcohol consumption. A glass of wine and I just can't manage more drinking. Hi Donna, this was such a fun drink to research! Fluffy Ruffles (the comic strip) is SO interesting! Thanks for your comment. Hi Mae, isn't Fluffy Ruffles (the historic person) so interesting? And this is a fun drink -- bet you'd like it! Besides, you'd be drinking history. :-) Thanks for the comment. John, I just love all the history you provide. 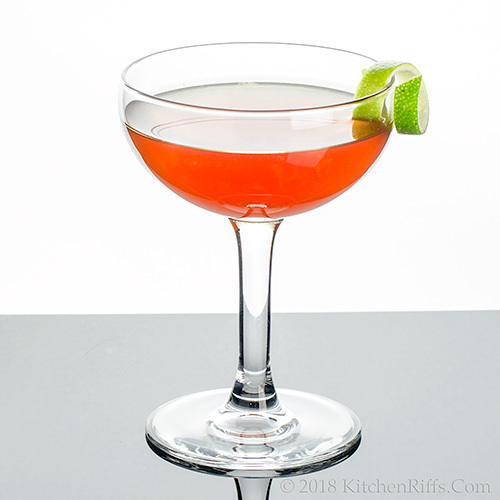 I just had a cocktail that reminded me of you and Mrs.Kitchen Riff. It was delicious and called a Royal Hawaiian. It had the same color as your drink and was made with egg white . I don’t remember the rest of the ingredients. Great history! I think Fluffy Ruffles would make a perfect name for a cat! So glad you took a photo of that iris. Mine disappeared so fast! Maybe I'll enjoy the last stragglers with a drink in hand. In honor of Fluffy! Hi Gerlinde, I vaguely know that cocktail, although we never put it on the blog. It's a good drink. Didn't remember it having egg white, though. As I recall the color comes from pineapple juice. Don't remember the base spirit, though. Thanks for the comment. Hi Abbe, ours disappear quickly too -- that picture is from several weeks ago, when ours were in full bloom. :-) Thanks for the comment. I love the name and origin. Ahead of it's time but still, flirting men causing her to loose her job? But the cocktail sounds so great! Never heard the term citrus hull before. Hi Evelyne, fun history with this one! Thanks for the comment. I have to try this just for the name alone. Who doesn't want fluffy ruffles? Hi Dahn, the name is great, isn't it? That's what attracted us to the drink (plus it sounded rather good). A bonus is the interesting history associated with it :-) Thanks for the comment. Hi Greg, I had forgotten all about Tony Orlando! Funny that your mom called him Fluffy Ruffles. :-) Who wouldn't want this cocktail in hand? :-) Thanks for the comment. I love these interesting stories and the beautiful drinks - I know I would love this one - rum is great! What a wonderful story Ms Ruffles has and what a lovely drink! Hi Tricia, we LOVE rum! Such good stuff. :-) Thanks for the comment. Hi Emma, isn't that story great? Drink is even better! Thanks for the comment. A fun name! I love the styling and great lighting too, John. I picture myself drinking this cocktail in my veranda under in a warm weekend afternoon! I am keeping this to try! Hi Angie, isn't this name terrific? Such a good drink, too. Thanks for the comment. Hi Katerina, the drink has outstanding flavor -- you'll like! Thanks for the comment. I'll be drinking that great sounding drink in shorts, should it warm up today. But then the drink would warm me up so it's a win, win! And I have all the ingredients! Looking forward to SS&SS! We do our best not to miss happy hour every night! Hi Pam, happy hour is a good tradition! :-) Thanks for the comment. Adding fresh lime juice is a great idea. The drink looks and sounds delicious. Hi Pam, the drink works without the added lime juice, but adding a bit really transforms the drink from good to excellent. Thanks for the comment. Maybe this should be the drink Landon makes next week when we finally move into our new house!!!! Hi GiGi, this would make a wonderful drink for housewarming parties. :-) Thanks for the comment. This was fun! I couldn't resist looking up the comic strip. My how times have changed. :) Some friends brought us some light run from Hawaii recently. This drink will be a good excuse to break the cap (like I needed an excuse). Hi MJ, the comic strip is definitely worth looking up! And yes, times have changed. :-) Enjoy uncapping the rum! Thanks for the comment. Hi Jackie, isn't the name neat? Love it! Thanks for the comment. Elegance in a glass. Lovely. This would be a lovely drink to cap off one of my afternoon teas in the gazebo this summer! Love the history you provide. Hi Amalia, good description of this drink! :-) Thanks for the comment. Hi Jean, this would be an excellent gazebo drink. :-) Thanks for the comment. The color of this is stunning! While I am not typically a rum drinker, the lime will really help the flavor be less intense. Hi Laura, isn't the color of this nice? And the flavor is lovely! Thanks for the comment. Fluffy Ruffles was my stage name back when I was on the beauty pageant circuit. I wish I'd have a few of these to get me through the swimsuit competitions. Hi Jeff, :-) that's a great name, isn't it? Thanks for the comment. John, Interesting history of the comic strip! I had a look online of a few of the comics- the women were still dressed in long skirts- amazing how just a few short years later, women's dress changed dramatically. Hi Fran, there was a LOT of change in the period from 1900 to 1930. Interesting times. Thanks for the comment. Hi Carolyn, the name is wonderful! How can you resist? :-) Thanks for the comment. Now this makes us want to run out and get the supplies. So simple but yet so delicious. Never seen red Vermouth before so we will have to keep our eyes peeled for that one. Hi Bobbi, red/Italian/sweet vermouth is pretty common, so you'll have no trouble finding it. I don't much like it unmixed, but when mixed in cocktails it's wonderful stuff! And this is a DANDY cocktail! Thanks for the comment. I enjoyed the history behind this post John! The story of Fluffy Ruffles is new to me as is this cocktail. This drink sounds great though and I will definitely try this one! Hi Marcelle, isn't the history fascinating? And the drink tastes fantastic. Fitting. :-) Thanks for the comment. This is so interesting. Love the name. And, I don't think I've ever had rum with vermouth. Must try! 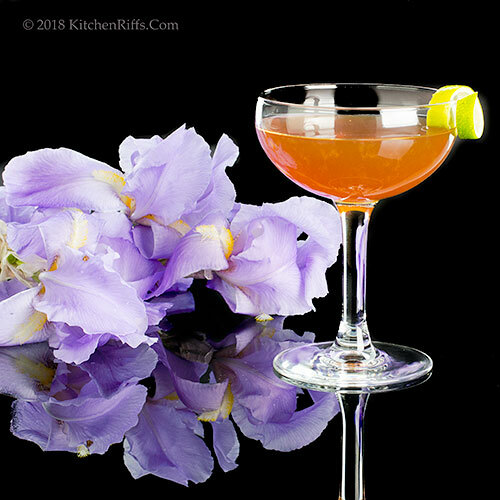 Hi Unknown, this is such a fun cocktail! Great history and flavor. :-) Thanks for the comment. I love the name! Though I don't envy Fluffy having to hunt for a job. Great cocktail and glimpse back into the early 1900's! Hi Liz, this really is a good drink -- I recommend it. Had it again this weekend! Thanks for the comment. What a great name! Bet the lime gives such a great flavour to this cocktail. Thanks John. Will be on the look out now. Wishing you and Ms. Riff a super weekend! Hi Caroline, the lime adds a nice hint of citrus to the drink. It's really a good one. :-) Thanks for the comment. Great name for a cocktail. Sounds yummy. Beautiful pictures!! Hi Dawn, it's a fun drink. We really like it -- had it again last night! Thanks for the comment.